Follow me on my quest to becoming a Domestic Goddess. My old-fashioned mom always dragged me into the kitchen with her when I was a kid and threatened that I will never find a husband without cooking skills. I, however, always responded by insisting that it was more important to be a successful career woman than to have a husband (yes, this is exactly how I said it at age 7). Alas, business school and a master's degree later, I am beginning to see that maybe there was some truth in her wise words! I fear that deep down is a domestic goddess bursting to come out! The fact that I am a newlywed might have something to do with it... as it turns out, mom was right all along. The way to my husband's heart, is in fact, through his stomach! Oh why hadn't I listened to her so many years ago?? In an effort to rectify the matter, I have now embarked on a quest to become the Domestic Goddess that my mom always knew I could be! There's no reason why you can't be a career woman AND have a husband with a happy tummy! Join me on this adventure as I try out new recipes and test out cool kitchen gadgets! This story does not, I repeat, does not have a happy ending. Please stop reading now if you are easily upset by messes and/or disasters in the kitchen. What I'm about to reveal is not for the faint of heart. There. You have been warned. This entry should really be titled "A Domestic Goddess' Fall from Grace." But since the naming convention of my blog entries has always been to reveal the featured recipe, I decided not to stir the pot. Har Har. But actually, that's not entirely true...if I wasn't SO ashamed of this Epic Kitchen Fail, I would really title it "Chocolate Dulce de Leche White Velvet Lamingtons." Because that's what they should have been: Lamingtons, not little random cakes. But since I failed so badly at the task, I decided to cover it up by insisting that they weren't, in fact, supposed to be Lamingtons. My favorite Brit, Mr.P of Delicious Delicious Delicious, emailed me a month ago about entering into a "Recreating the Lamington" contest. After further investigation, it turns out that the Lamington is the favorite national dessert of Australia, comparable to our Twinkies. Here are the essential elements: (1) a small square cake, (2) some sort of filling, (3) a chocolate ganache coating, and (4) sprinkles covering the outside. Behold, Exhibit I: Cherry Lamingtons from P's Blog. I'm a sucker for little cakes and beautiful Brits, so of course I immediately agreed! I mean c'mon, how hard could it be? Plus, I felt an instant fondness to these because they're practically related to cupcakes! Cupcakes = little cakes. 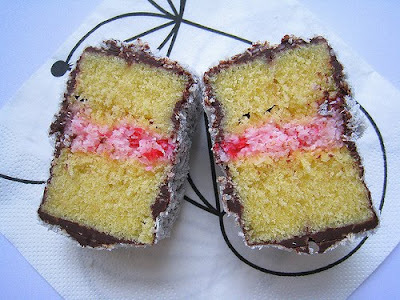 Lamingtons = little cakes. You follow the reasoning? I spent about a week strategically planning and coming up with flavor combos. I settled on three different ones and set out to make the first one, containing the following components: (1) Rose Levy Beranbaum's White Velvet Cake, (2) A dulce de leche filling, (3) Chocolate ganache and fresh homemade caramel sauce coatings, and (4) Chunky sea salt for the "sprinkles." PERFECT. A reader once emailed me about Dulce de Leche. She told me that you can make it by boiling a can of sweetened condensed milk for three hours! I was instantly intrigued and knew that I had to put it to the test! I'm usually all for making stuff from scratch, but this seemed like such a fun experiment that I made an exception! It was really easy! I ripped the wrapper off and boiled it. For three straight hours. lol. I had an extra pot of boiling water on hand and added it to the pot every 20-30 minutes, as the water evaporated. The trick is to always keep the can immersed. Um, WOW. Just WOW. It was amazing. And I can't even describe to you the sheer GLEE I felt bubbling up inside me when I opened the can to reveal the beautifully thick caramel! It was a moment of pure happiness and joy! And boy, was it divine! It's so amazing on its own that I could've just eaten spoonfuls of it and called it good. You didn't even need the rest of the dessert! It was enough to satisfy my tastebuds! I urge all of you to immediately go boil a can of sweetened condensed milk. And for no other reason than to scoop it out of the can, straight into your mouth. Trust me, you won't be disappointed! This is how I "got rid" of the leftovers. tee hee. The white velvet cake is pretty straight forward. Mix the liquid ingredients first. Then combine all the dry ingredients. Pour it into a 13x9 pan and bake for about 30 minutes. Invert it on a cooling rack and wait for it to cool completely. Then when it's cool, cut it up into little cubes. I really love this cake recipe. It was first introduced to me by Patricia of Butteryum. This woman is SO incredible at baking cakes that I often wish she was my neighbor, so that I can try all the amazing things she makes. Anyway, I was in search of a good white cake recipe and of course I asked her, the Cake Goddess (and ultimate authority on such matters). When I asked her why it was called "white velvet," she explained that it's because it feels like velvet in your mouth. And boy, does it ever!!! The first time I made this cake, I was totally blown away by it! I never thought I could be so in love with a simple white cake. Anyway, it's now my go-to recipe. It's perfect with any kind of frosting and flavoring. I made fresh, warm caramel! Mmmm... so delish! Click here for step by step instructions. I also made a decadent dark chocolate ganache! It was so far so good until I started to put it all together. I sliced the little square cakes in half and smoothed dollops of that beautiful brown dulce de leche into the centers. I made little sandwich cakes that were sooo cute! Little did I know, this would be the last time I would refer to them as being "cute." When I did research on how to coat these, a site suggested that you ladle the chocolate over the little cakes. It looked so easy when they showed it! Um, not so easy when I tried it. It just wasn't going to happen, period. Not only did they not coat all the way, they were no longer perfect little squares! Not even my awesome camera could salvage this mess! Ugly is ugly no matter how you photograph it. I made batch after batch of these and failed over and over. I spent ALL day. I kid you not. Literally all day, from 9am until 5pm attempting to coat them beautifully, without success. Not to mention, my kitchen was an absolute mess! I had bowls upon bowls of chocolate-coated messes! The only way I was able to salvage them was to put them into little mini cupcake baking cups and pretend that they were supposed to be "artistically messy" cakes. I ended up just drizzling the ganache and caramel over them, as if it was always supposed to be that way, then topped it off with a tiny pinch of sea salt. Humph! I had admitted defeat! Plus, by that time, my baking self-esteem was so low that I couldn't bare to attempt another batch. I was going back and forth about whether or not I would post this entry. I was SO ashamed at my epic fail and didn't want to admit to my defeat, let alone publicly announce it to the world! Plus, I felt like I had an image to live up to...you know? Everything on my site is always pretty, well put-together, and well thought-out. How could I possibly try to pass this mess off as good blogging material? lol. (1) AMAZING white velvet cake! It's like four of the most amazing things known to mankind all wrapped up in one! Who the hell cares if it's ugly when it's simply one of the best desserts ever?? Am I right or am I right? So I encourage all of you to be brave and give these ugly little cakes a try! Don't judge a book by it's cover, right? You'll be so blown away by how delicious these are that you won't even care about what they look like. hehe. After posting this, a reader emailed me, saying that sometimes boiling a can of sweetened condensed milk can be dangerous. If it isn't completely submerged in water at all times, it can explode. So you have to be really careful about keeping an eye on the water level. You can also make dulce de leche by pouring the sweetened condensed milk into a pie plate, covering it tightly with aluminum foil, and placing it in a water bath to bake for 1-1.5 hours. This method is safer. Here's a great link that she sent me. Thanks Jeana! You're so funny Judy - "little broken tombstones in a graveyard of little ugly cakes!". I know how you feel - can't believe we both posted about cake failures today. I tell you, we are long lost best baking souls! Never the less, I have never heard of a Lamington before... and I'm sure 98-99% of Americans haven't either, so it looks like you have a hit recipe on your hands! PS - thanks for your very kind words. You'll surpass me yet my dear!!! I have a pie that didn't exactly behave very well that I have been thinking about binning, rather than posting. I'm doing to do it! (Post it, not bin it!). I'm adding you to the round up! Oh gosh, thank you for sharing this story with us! I just popped over from Delicious Delicious Delicious :) Your creations are so beautiful and it makes me feel better to know that even the professionals can sometimes get it wrong. Having said that I would probably hoover up all of these lamingtons... Messy usually tastes awesome! :D And o.m.g... I never knew you could make dulce de leche by boiling a tin of condensed milk. I have to give that a go! I would never have know it was a mess up until I read your entry. It looked like awesome chocolate gooeyness!! But it happens to everyone. Love you blog!! It's so disappointing to work your tail off to make a masterpiece and then not have it turn out the way you wanted it to! So sorry! I do know this feeling all too well! What a calorie bomb! They didn't turn out the way you wanted doesn't mean that they didn't look good! If that's what "failure" looks like - let me hop on the loser train!!! I only wish I were in your kitchen to lick the bowl - ahem, I mean help you clean up the mess! Aw! You are my hero! I have just started baking after years of fear of failure. You know what you've taught me? A failure can become a great success with some very witty, adorable writing. Love it and I bet they still tasted perfect! You are so funny, no one would have known these were mess ups. Regardless it looks yummy! Next time (if there will be a next time), stack the mini cakes, place them on a platter, wrap platter and cakes with plastic wrap (not too tightly) and refrigerate for 30 minutes and then pour the chocolate ganache over the cakes. super nice ! I love your flavor combo! Oooh! These sound so delicious. The problem I think may have been your recipe. In Australia, we don't actually use chocolate ganache, just a thin watery mix of icing sugar and cocoa and water. And you really do have to get your fingers messy and dip each side of the square, because otherwise the watery stuff would just sink in the top. But fear not, "artistically messy" works for me more often than it should. I'd vote for these if I could! Hey Judy, I made some for Australia Day this week and remembered why I tend not to make them. Messy, unattractive little creatures LOL! They will be on my blog later BUT they are best dipped in a VERY thin chocolate icing as the cake is so soft, they are very messy, lots of us Australians use day old cake (less crummy, soft fall apart) which puts me off because it isn't fresh or slightly freeze before dipping. Usually drain off on the end of a fork and roll in coconut. MESSY, VERY MESSY. I bet yours tasted just as good. There is a reason lamingtons are covered in coconut. It hides many imperfections. Lamintons are also a little bigger which also helps to hold the shape. Mind you I agree with the others that have mentioned that they don't look ugly. At last! Now I know Judy isn't perfect! Sheesh - I wouldn't have gotten half that far without some sort of disaster! Judy, these look marvelous!!! What are you talking about - I love the glazing! It's drizzled over so you can see the filling, etc - they don't have to be completely covered. Truly amazing - I bet they tasted wonderful too! I chickened out and bought two jars of leche... :) But I would like to experiment too. So beautiful Judy! LOL Judy, this is my first visit to your blog (via tripple Delicious) but I have to say it wont be my last:) Considering I have MORE failures than successes when experimenting (aiming to turn it around this year;)) I appreciate you sharing your experience with us:) Freezing the cake makes them easier to mess with (LOL I found that out AFTER making my Lamingtons) and I too had a ganache that was too thick. I added a ton more cream to thin mine out and it did still set. My mouth is watering at your combination - the teenage boy who lived next door to me when I was little used to boil up a tin of sweetened condensed milk when his Mum was out and eat it all then hide the empty tin in our rubbish bin! Traditionally you use stale or day old cake as that was one of the reasons they were created. The other tip as Coby has said, if you use frsh cake is to freeze it. And also you usually only put a small amount of filling if you need to dip them so they don't fall apart. What you have discovered though is how great they taste and we love them! Thanks for sharing your "disaster" I agree that sometimes everyone should see that even the best bakers have "off" days. How did I miss this post!! LOL Love reading your blog!! I agree with the other Aussies here.... This reciepe for lamingtons is just too complicated!!! And effort at making the good ol' Lamington fancier than it should be.. Standard lamingtons are vanilla sponge, covered with a thin chocolate icing and coconut.. My fav lamingtons have gorgeous soft sponge, and when you bite into it, the chocolate icing has soaked (just by a couple of millimetres) into the sponge, so the whole experience isn't dry, and definately not tasting like day old cake! LOL Here's a couple of basic recipes to give you the idea. But be warned, it definately it a messy experience! Hi, I love your blog and I'm dying to try your recipes and suggestions. But am here to leave you one: instead of boiling the sweetened condensed milk, why don't you buy a ready boiled one? It prevents lots of mishaps.